"Every morning my wife and I have coffee and we divide up the newspaper. We can't do that anymore. Put it back the way it was!" The anger and the pain here are real, but we didn't go down this road without thought, or good reason. We made this change for three reasons: to provide more focused local coverage, to help the advertisers and to save money. The last two goals could only best be accomplished with the tabloid product. This is the harsh reality of doing business in the midst of the greatest economic meltdown of our generation: we simply have to find ways to save money. Could we have avoided this? 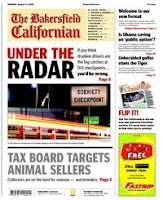 Sure, but we would have significantly raised the price of the paper, and that is simply unrealistic in a price sensitive market like Bakersfield. We could also have kept the current broadsheet format but made the paper so small in page count that it would have been reduced to two sections, that we would have run into the same resistance regarding "dividing" the paper at the breakfast table. So at the end of the day the one option we didn't have was to continue to do what we were doing. Like that fat free milk, it will grow on you. Spin it any way you want. The bottom line is that people hate it and that isn't going to change. Get used to the hate mail Richard. There's a lot of hate in this town and you're a convenient target. I'm not a big fan of your new paper but I'll get used to it. Good luck. I love it! Screw the naysayers....the only legitimate complaint is that one can't "share" the paper without disassembling it. So what? It's easy to handle and read and travels better than the full size format. Kudos to you and all the Californian staff for striving to stay relevant in a very difficult media market. Surveys have shown that two of three people who post as "anonymous"( not counting this one) are idiots. I thought I would hate it, but it turns out that I sort of liked the new format. The only days my husband and I share the paper is on the weekends, when the paper goes back to broadsheet.... so I guess I don't mind the change after all. This change doesn't have much effect on me. I read online. Sundays I may wander down to the machine and see if it will give me a paper for my coins totalling $1.50. I offered a suggestion on your earlier post regarding this topic; but my comment was never published. How about returning to an evening edition and having "paperboys" deliver the news? You won't have to pay adults adult like wages. Kids will learn to earn. Reading the paper in the evening is a nice way to wind down. Hope you consider this idea.